A man named Simon and his two sons, Alexander and Rufus had front row seats on the “way”, the “Path” that Jesus’ life was taking in his final moments. They had such a great vantage point (whether they liked it or not) that the father, Simon, was pressed into service carrying Jesus’ cross the rest of the way, along the path to the hill that Jesus was crucified upon. I assume that the boys followed along. Nonetheless, they walked the path that led to life. They potentially watched the whole thing unfold before their eyes. This was their afternoon at what should have been a celebration memorial week. What must it have been like, what kind of culture treats public executions like the local Fair? I don’t imagine it was too different than a hanging in the early days of America’s history. You read accounts of people packing lunches or traveling to town to see the spectacle. The more “civilized” our society gets, the more genteel it thinks it is and really our morbid sense of voyeurism is just hidden away and brought out for special occasions. that to Jesus was a path of death as well. 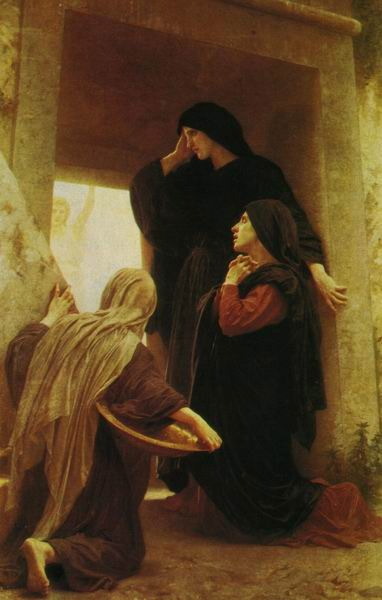 Now I’m reading the story of Mary and Mary and once again, they are traveling on “their way” to the tomb. Again the idea of traveling “on their way” suggests a path, a path or road up to Calvary, a path or trail, maybe a road, to the garden where Jesus was laid to rest: to the tomb. And so we see these characters making their life’s journey along a path. What path are you on: the path to graduation, the path to success, or maybe the path to marriage? What path are you on? Does this path lead to life? At the end of the day, at the end of our lives, does the path we traveled lead us to life? Jesus traveled a path. He came to this earth with a purpose. He came to die. No one took his life, as a matter of fact he made it clear that his life was his to lay down and his to take up, and that he chose to lay it down voluntarily. John 10:17. He may have been murdered, like a lamb being led to slaughter, but he knew what was going on and walked into the butcher shop intentionally. There was a debt that needed to be paid and he was here to pay it. There would be no stopping Jesus, no diverting his eyes from the prize, from the knowing that people would be set free from the clutches of death and the devil himself. They would be snatched from the very smoke of Hell and welcomed home, back to a relationship with Father. Religion would raise it’s ugly head and try to tell them that they needed to earn this free grace that they received. That simply isn’t true. Jesus’ death on the cross is for the sins I have yet to commit, as well as the ones I have already committed. I cannot earn more of God, more of Jesus, more of the Holy Spirit, simply because there is nothing good about me. I can never deserve the favor or the love of God in Jesus. Ever! So we try to live up to what we have been given freely, but we must in turn hand it out freely. You must as well. This is the Path we have stepped onto as Christ followers. As I think about Easter, I am aware of this passage from Psalm 16. That God has made known to us the “Path of life”. Jesus said, “Anyone who would come after me must deny himself, take up his cross and follow me.” There, that is the Path of Life; the path that leads home. The path that brings us back to the very presence of our Father. For Jesus the Path of Life lead from his rightful place, his home, to our dirty place, earth and sin. Then the path lead him into relationships with you and I and people like us as he walked a dirt path to Calvary. The Path of Life leads to death on a cross. Death on a cross leads to entombment of our flesh. The resurrection of our dead lives leads to the mission of Christ. The mission of Christ leads home. What path are you on and where is it eventually leading you? IS IT DARK WHERE YOU ARE? Some times when we are sad, depressed and can’t seem to gather our courage, we just stop moving. We don’t look for God. I get to interact with people everyday. Some people are having a great day. Some people are facing very scary circumstances. Shoot, sometimes I‘m facing giants in my own life. I’m going to shoot straight with you, this “life of the pastor thing” sometimes, is way too much fun and then sometimes it is not all sunshine and lollipops. No sirrreeee, sometimes it is down right scary!! Do you know what to say? and do you know where to go? and God they are scaring me to death. And then there is the occasional, “Man this has got to be a great gig, I’m feeling called to the ministry” or “So what, you work an hour a week on Sunday, two if you have multiple services? I need me some of this.” “What do you do all day?” Pastors are not immune to depression, self loathing, and struggling with life. Hahahahahahahaha, Sometimes it’s even crazy here at the church and if you came in you would see that the crazies are running the show. Heeeelllllppppp! Really though, what do you do when life is just on hold? What do you do when the darkness seems a little too dark for you to step out into the light? Mary was having that kind of day. This is Mary Magdalene, not Mary the Mother of Jesus. Can you imagine Mary the Mother of Jesus’ weekend? Her very first Easter and what a downer it was. Seriously now, I cannot comprehend the tragedy of losing a child, even an adult child. And then for it to be the Son of God you lost to murder. Here you are, 33 years after you tried to convince people that this pregnancy was an act of God, just when things were looking like the community was believing that he was the Son of God, or at least that he was someone special to God, this happens. What an Easter this is turning into. Those stinking Romans! Big mean nasty warriors and fighters that think they can do what ever they like! THEY HAD NO CAUSE. What about those religious leaders? Hauling her son into the Romans; couldn’t even do their own dirty work, and it WAS DIRTY WORK!!!! Yeah, who did they think they were? What an Easter this was turning into. Oh it WAS a special week. People may not have recognized that it was the first Easter, but it was still special. It was a couple days after the Passover. BIG holiday for the Jewish people: BIG. Now it was the week of the Feast of Unleavened bread. It was time to remember how faithful God had been to Moses and the gang. God didn’t appear to be faithful to the followers of Jesus. People were celebrating, not this small group of Jesus followers. Small may be an inappropriate term, they were a group bigger than 80% of the churches in America if my understanding is right about 80% of the churches in America. Back to Mary Magdalene, It was dark. It was dark for everyone that weekend. At this moment in time Mary is standing, in the morning, at the tomb, with a gardener. At Mary’s darkest hour at the time, she didn’t see Jesus standing there. God is standing next to Mary. The apple of her eye, the reason for her concern, the answer to her pain, is standing right next to her. 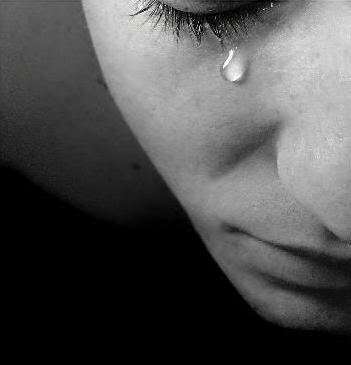 Sometimes we are so hurt, the pain is so much, we are so dejected, that we miss that God is right there. Could we but lift our eyes and ask a question, we would hear Jesus call our name. The pain may not go away, the hurting may not stop, but we would realize in that moment that we are not alone. nor would he forsake you. In your darkest moment he is right there with you. but God wants to walk with you. and the height of greatest trial. God is standing right there. Lift your chin and look a round. He may look like someone you don’t know. He may be a song whispering in your ear. He maybe a Word that you read in the Scripture. He could be anywhere but he is there with you. You don’t see him because you don’t expect him. Let him surprise you, lift your chin. Look around, He is RISEN indeed. The sun is coming up, it is Easter in your life, He is risen, look for the Lord. Easter: pastel dresses, and colorful ties, chocolate Easter bunnies and jellybeans. You may have more to your Easter than that, actually I hope to you do. I have to admit that when Easter comes around I look forward to it. I love the lilies at church, the spring weather, and the expectation and, I have a bit of an affinity for jellybeans. 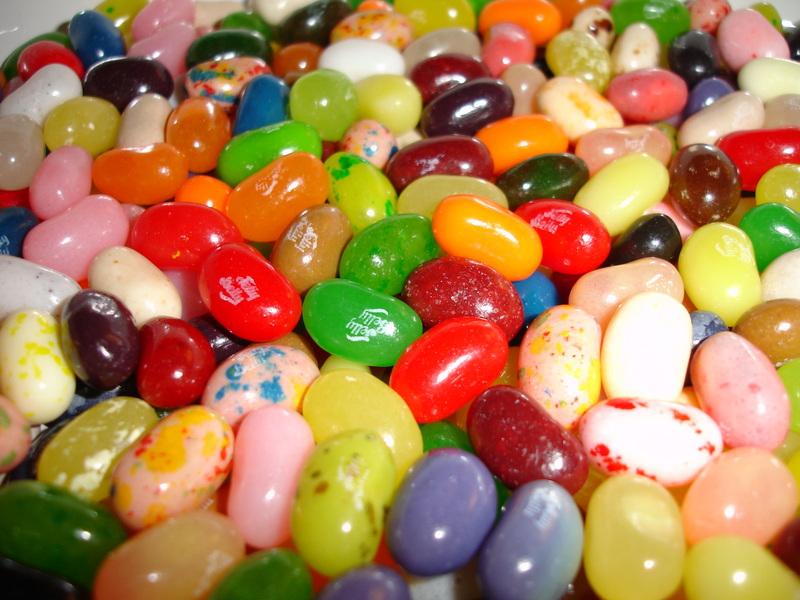 I especially like the Starburst ones, or the Jelly Bellies. I pastored out in Oklahoma for ten years and in the course of ministry I had a day that will forever be etched in my heart. I had arrived at the church during the week just as a dear grandmother and her little grand daughter arrived from having been to the local nursing home. The little girl had a banana, and a Ziploc bag of jellybeans (20 or so), and as I stepped out of my truck to go in, I asked her if I could have one. She said, “No, but ya can buy one.” I laughed inside smiled outside and asked her how much for the whole bag. I couldn’t remember what her answer was but for some reason I remember having something in the order of a dollar in change in my pocket. I asked her if she would sell me the whole bag for all my money and she did. Every year as Easter rolls around I am reminded of that afternoon and that young lady. I asked her about her morning during our transaction, and she was excited to tell me about all the people she got to visit at the nursing home. She told me of the games they played, and the conversations. Her grandmother was a saint. Her grandmother had a real heart for visiting friends and family in the nursing home and spreading Christ’s love. She just wanted to love on these folks and let them know they were important. She needed to visit these friends and family members; she had to. There was something inside this woman that drew her close and compelled her to share and minister to others. The least likely to do the most important. I love that Christ first revealed himself to Mary and some of the other women. God has a way, in the whole redemption story, of using the least likely to do the most important. While we know the names of some of the women that traveled with and supported Jesus, we do not hear much about them. We hear about Peter walking on the water, John leaning back on Jesus at the last supper, Peter, James and John going up the mountain with Jesus, but we do not hear much about the women traveling with Jesus. Those positions aren’t real flamboyant or showy. Those ladies aren’t super Apostles, but you do have to wonder what all they were privy to. The conversations, the miracles, the people, and the crowds: they were there. It was Mary that got to run back to the disciples and tell them Jesus had risen from the dead. She was the one that brought them running. A woman. The Easter sermon that is preached every spring around the world was first delivered in the heart and on the lips of a woman. Who are you going to invite to church this Easter? Do you have a need to tell people that he is risen and they need to come and see? Is your relationship a relationship of consumerism or is it a mission that you need to be a part of? Those days between when Jesus was crucified and Easter Sunday morning were dark days. There was a palpable hopelessness in the air. The kingdom that these disciples and followers thought was coming to pass didn’t happen. Jesus was crucified, the Romans were still in power, Herod and Caiaphas were not real happy with the “followers of the Way.” And now these followers, numbering about 120, (Acts 1) were locked away, hiding from anything and everyone. And then. And then. And then Mary broke into the room and needed to tell everyone that she had seen Jesus. Up from the grave he arose! There is something about dark days that opens our hearts and gets us ready for God. 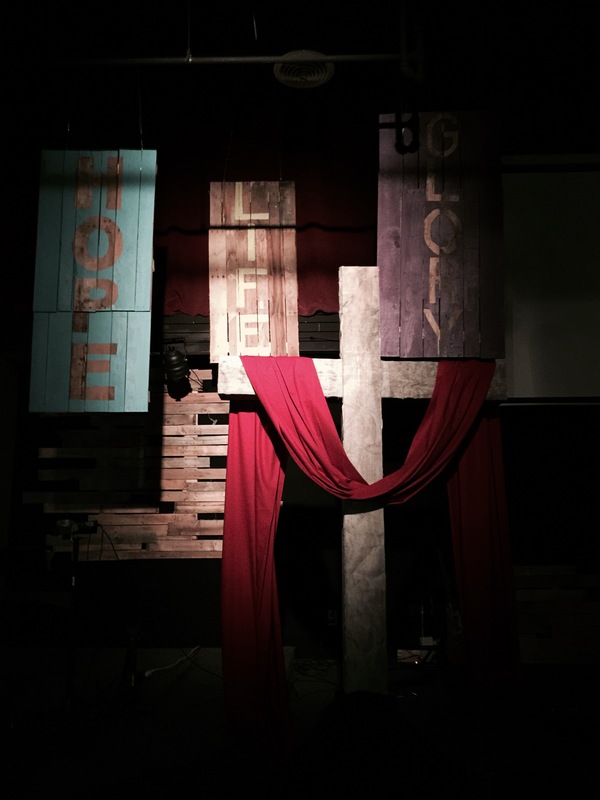 There is something about Friday afternoon at that cross that got people ready for Sunday morning at the empty tomb. I’m talking about there is something about dying that gets us ready for living. Where will you be Easter Sunday morning? Easter is just a couple weeks away; are you far from God? Do you feel like he left you and now you are hiding in your life, scared of your future, alone and without purpose? Come back to Jesus, he is not dead, He is alive, he is here and we want to invite you to join us. and he still loves you very much.